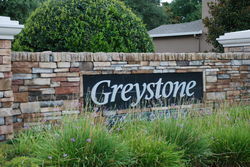 Greystone is a gated community located off Oregon Ave in Sanford FL next to Derby Park. Originally developed by Morrison Homes in 2005, this well kept community consists of townhomes and duplexes. The homes feature two car garages and some have pond frontage. Greystone has a community pool and playground. Restaurants and shopping are nearby at the Seminole Town Center Mall, Heathrow's Town Center and Park Place and Timacuan. Access to both SR417 and I-4 are within 5 miles from Greystone for easy commuting.